Vienna, Albertina no. Sc.R.503, Inv. no. 415. Pen and ink and warm brown washes, very slightly reddish, heightened with white washes, over very faint traces of black chalk, on light brown washed paper, 25.7 x 44.1; lightly squared in black chalk, and impressed with a stylus along the major outlines; compared to the copy of this drawing in the Ensba in Paris and to the engraving of this scene (see COPIES below), it can be seen that the Albertina drawing has been cut a very small amount at the top and bottom and the left edge, and that the right side has been trimmed about 5 cm., removing almost entirely one column and the chair behind the Virgin; the white highlights have oxidized in a few places and some of the heaviest, opaque highlights have flaked off; center vertical crease; laid down. Inscribed in ink on the base of the central column: Rosso Fiorentino. Ao 1530. — . PROVENANCE: Albert von Sachsen-Teschen (Lugt 174). 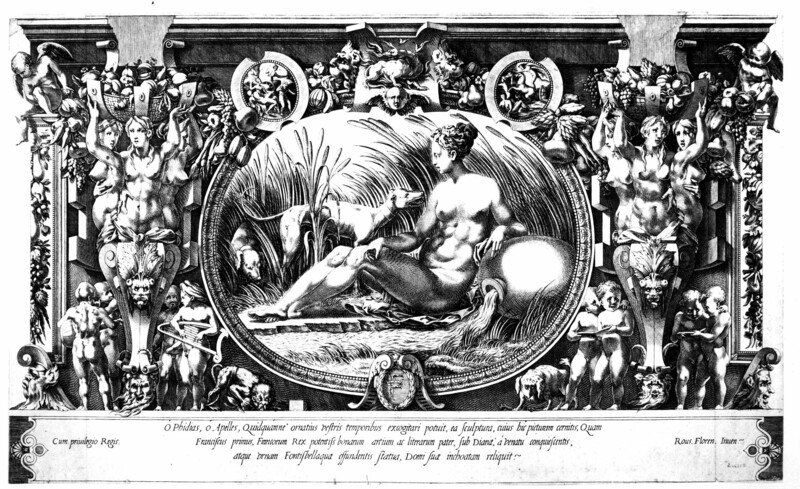 By implication mentioned by Vasari, 1568, II, 308 (Vasari-Milanesi, V, 433) as “una Nunziata bizzara” in a reference to all of Rosso’s works that after his death were engraved in France by René Boyvin. Wickhoff, 1892, CCXIII, as Rosso. Kusenberg, Strasbourg, 1931, III, speaking of the copy in Paris recognized the influence of Dürer. Kusenberg, 1931, 151-152, no. 56, 160, as a copy of the drawing in the École des Beaux-Arts and as made for the engraving; he dates the latter drawing around 1530. Levron, 1941, 63, no. 32, 74, repeats Kusenberg and attributes the drawing to Boyvin. Carroll, 1961, 452, Fig. 13, 453-454, as Rosso, 1530-1540. Carroll, 1964 (1976), I, Bk. I, 261-263, II, Bk. II, 436-441, D.54, Bk. III, Fig. 135, as Rosso, around 1538-39. Béguin, 1970, 8, 82, Pl. VIII, as Rosso, c. 1530. Oberhuber, 1971, 39, 40, Fig. 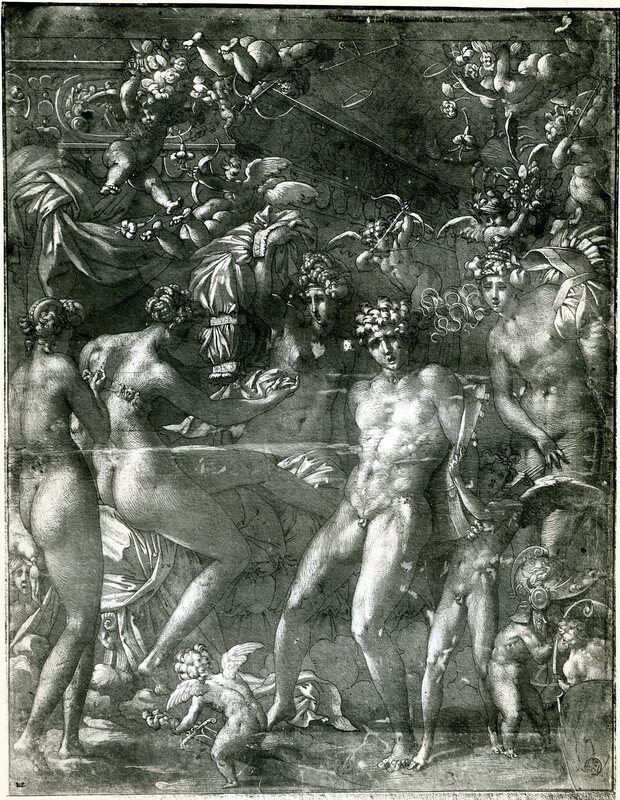 14, 49, as Rosso, and the preliminary drawing for Rosso’s engraving. Béguin, in EdF, 1972, 187, and in Fontainebleau, 1973, I, 41, Fig. 5, II, 65, no. 212, as Rosso. Zerner, in EdF, 1972, 251, under no. 287, as Rosso and as possibly influential upon the engraved Annunciation by Jean Cousin the Elder; the same in Fontainebleau, 1973, I, 79, under no. 287. Knab, 1975, 150, no. XVIII, as Rosso, and suggests the influence of the Sistine Ceiling. Forlani Tempesti, in Primato del disegno, 1980, 193-194, no. 460 and Fig., as Rosso, French period. Lévêque, 1984, 163, 164, Fig. Carroll, 1987, 40, 182-185, no. 60, with Color Pl. Béguin, 1988 (1989), 14, 15, Fig. 13 (detail), as probably Rosso’s “Nunziata bizarra” mentioned by Vasari. Franklin, 1988, 326, as probably made for a painting, and incidentally also engraved. Acton, in French Renaissance, 1994, 308-309, under no. 74, as Rosso. This drawing is specifically related to an anonymous engraving (Fig.E.133) of the same size but in reverse inscribed: .ROVS.FL.INVEN.. In all probability this engraving is the “Nunziata bizarra” that Vasari says René Boyvin engraved in France from a work by Rosso.1 That the Albertina drawing was used as a direct model for the engraving may be indicated by the stylus marks on the drawing, although these marks could possibly have been incised to make the drawn copy in the Ensba (see below). Since 1892, when the Albertina drawing was first published, Rosso’s invention of this image of the Annunciation has never been questioned. The inscription to Rosso on the drawing indicates that the identification of his authorship of it goes back before that time. 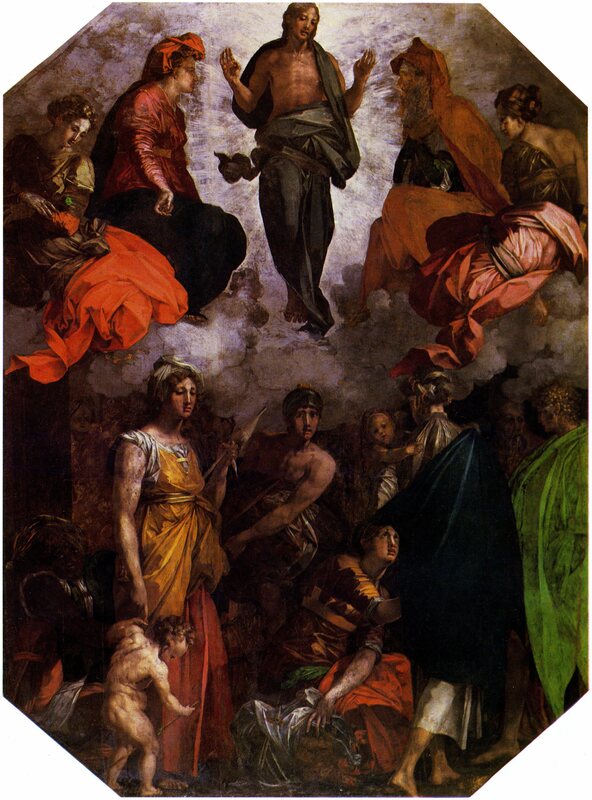 Stylistically, the figures in the drawing, in their proportions and in the richness of their garments, resemble the figures in Rosso’s Christ in Glory (Fig.P.20a). 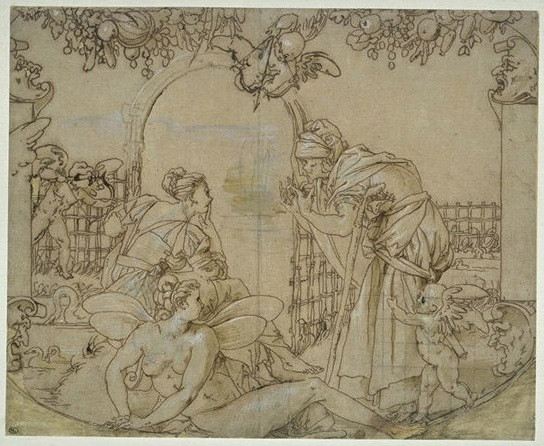 In these same respects the drawing is similar to his Vertumnus and Pomona drawing known from a copy in the Louvre (Fig.D.46Aa). 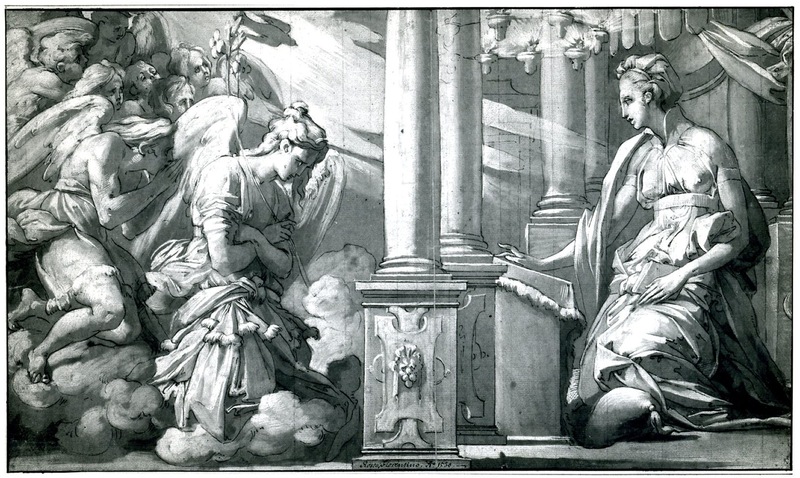 From the evidence of this copy and of Fantuzzi’s etching (Fig.E.62a), the composition of this scene, with the major figures placed across the foreground before an architectural diagonal receding behind them, is, in very general terms, like that of the Annunciation. 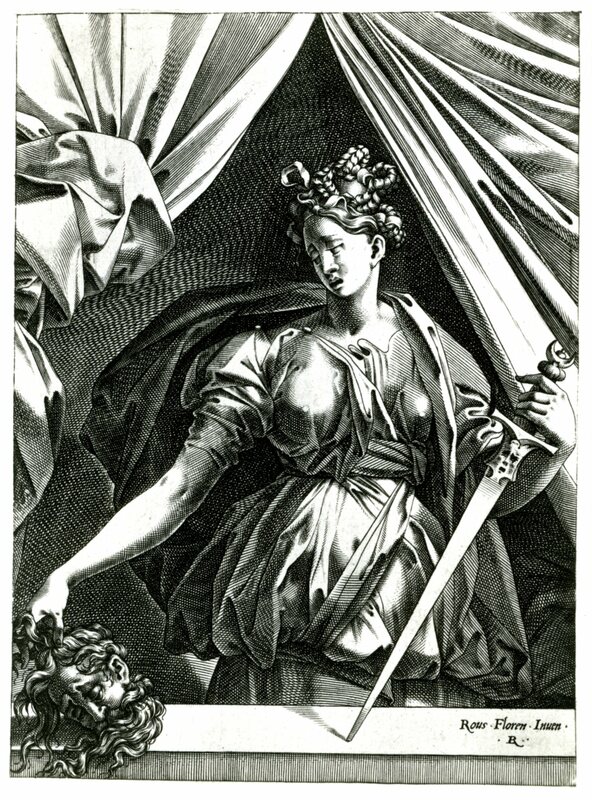 The luxury of the drapery of the latter also appears in Rosso’s Judith, engraved by Boyvin (Fig.E.7). The Virgin’s profile and flat-topped ear are quite similar to those in Rosso’s Nymph of Fontainebleau, engraved by Milan and Boyvin (Fig.E.103). All of these comparisons and many others that could be made with Rosso’s work make it very clear that the invention of the Albertina drawing, in all its details, is Rosso’s. Graphically, the drawing is similar to the Mars and Venus of 1530 (Fig.D.42a), but the white highlights in the Annunciation are more broadly applied and with almost no cross-hatching. Hence, its draughtsmanship is somewhat closer to that of Rosso’s Petrarch drawing at Christ Church (Fig.D.47a). 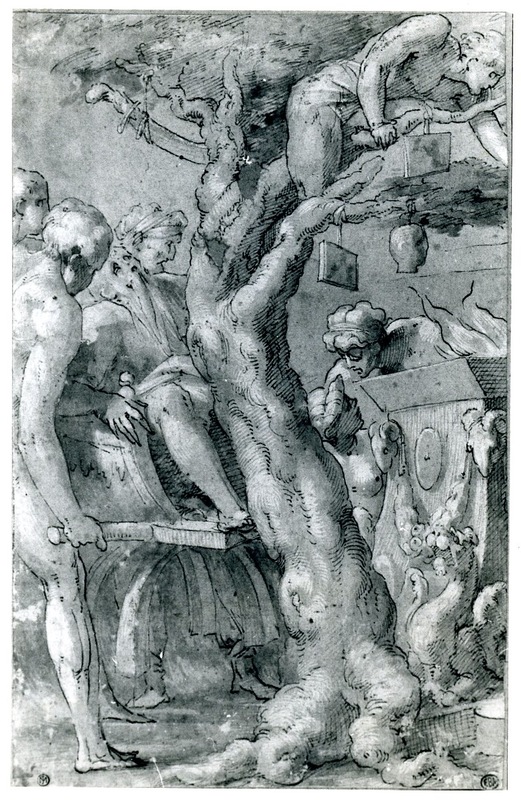 There is evidence of this same kind of drawing in the copy in the Ensba in Paris (Fig.D.50B) of a study for the Sacrifice in the Gallery of Francis I. 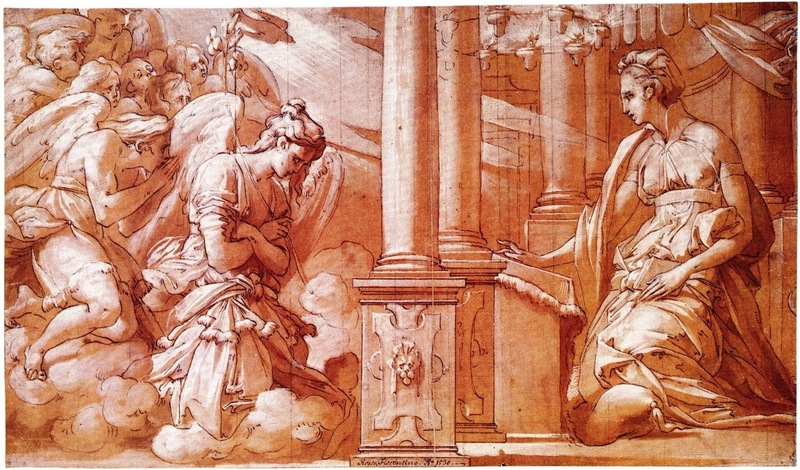 The copy in the Louvre of Rosso’s Vertumnus and Pomona shows that it was most probably derived from a drawing executed like the Annunciation. There is, therefore, sufficient evidence to indicate that the graphic mode of the Annunciation is specifically of a kind that Rosso used. 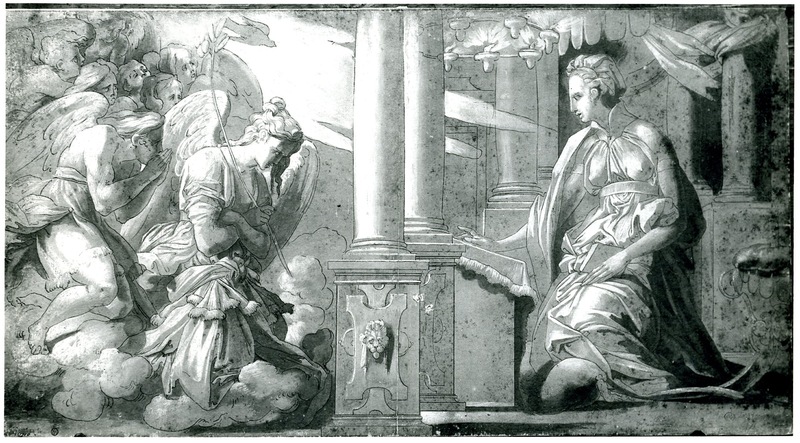 Kusenberg’s evaluation of the drawing, repeated by Levron, that the Albertina Annunciation is a copy of the drawing in the Ensba in Paris, finds no support in a comparison of photographs of these drawings, a kind of comparison that he may never have made. The latter drawing is, in fact, a copy of the other. Accurate as this copy is, it lacks all the subtlety of the Albertina drawing. The pen lines in the Paris drawing are, by comparison, monotonously regular and the contrasts of lights and shadows are abrupt. The execution of the Albertina drawing is infinitely more refined, and to such an extent as to indicate that it is without question an autograph drawing by Rosso qualitatively on the same level as his Mars and Venus and Petrarch drawing. The engraving of the Annunciation in France would seem to indicate that the drawing was also executed there, and this is supported by its style, which is most like that of works that Rosso created during the last ten years of his life. 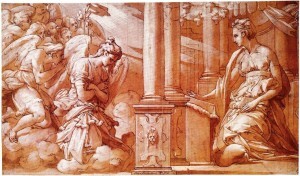 However, the date of 1530 that appears on the drawing cannot be taken to indicate an informed opinion, as the same date and a similar inscription to Rosso in the same handwriting are found on another drawing in the Albertina of a composition by Primaticcio that was painted later at Fontainebleau.2 Still, the Annunciation was probably done not long thereafter, as stylistically it is so similar to the Christ in Glory, finished in the spring of that year. It is also very similar in its richness and elegance to the Judith, engraved by Boyvin after a lost painting possibly done in 1530-1531 (see L.35). A certain ease about the Annunciation may indicate that it is later than the Judith and closer in date to the Vertumnus and Pomona, which could date as early as 1532. An absolutely certain date for the Annunciation cannot be determined but it would seem to belong with a group of works that may have been done just before Rosso began his decorations at Fontainebleau. A date in 1531 or 1532 can be suggested for this drawing although a somewhat later date is possible. However, the Annunciation was probably not done late in Rosso’s career, as I once thought, as it is not especially identifiable with works by Rosso that can for several reasons be dated after 1535. COPY, DRAWING: Paris, Ensba, Masson 1195 (formerly 313; Fig.D.43 Copy). Pen and black ink, brown washes, heightened with white, on brown paper, 26.2 x 49; creased down the center; the whites have slightly oxidized in places. Inscribed in ink in the lower left corner: Rosso. PROVENANCE: Jean Masson (Lugt 1494a). LITERATURE: Masson, 1927, 50, no. 313, as Rosso. Kusenberg, 1931, 146, no. 78, 160, as Rosso, around 1530. Levron, 1941, 74, under no. 162, as Rosso. Barocchi, 1950, 225, Fig. 220, as probably a copy of Boyvin’s print and possibly from the Second School of Fontainebleau. Bologna and Causa, 1952, 61, as anonymous, French, sixteenth century. Carroll, 1961, 453f., ns. 30, 31. Carroll, 1964, (1976), II, Bk. II, 440, under D.54, as a copy. Béguin, 1966, 58, as not from the Second School of Fontainebleau. Forlani Tempesti, in Primato del disegno, 1980, 193, under no. 460. Carroll, 1987, 185, n. 1, under no. 60. This drawing is a very accurate and contemporary copy of Rosso’s Annunciation in the Albertina. So accurate is it, in fact, that it even reproduces that part of the circle of lamps over which Rosso drew a column. PRINT: Anonymous, E.133 (Fig.E.133). Engraving, in reverse. Also attributed to Boyvin. 1 There are only three engravings of the Annunciation that have been attributed to Boyvin the designs of which have been given to Rosso. One of these, a jewelry design (Robert-Dumesnil 163; Levron, 1941, 79, no. 270, Pl. LXXII, Fig. 103) is datable around 1598 and therefore cannot be the print mentioned by Vasari in 1568; even if done earlier, it is hardly a print that Vasari would have singled out for special comment. 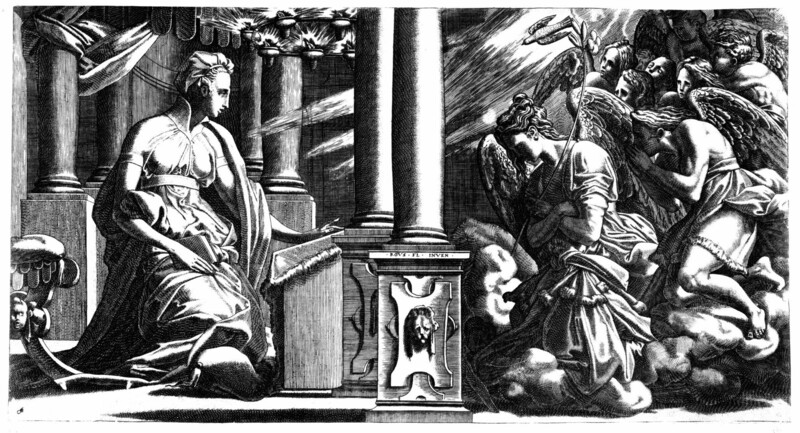 Another engraved Annunciation (Robert-Dumesnil 4; Levron, 1941, 73, no. 161), inscribed neither with Rosso’s name nor with Boyvin’s monogram, is a small, slight print showing the Virgin and the angel Gabriel in two separate roundels. 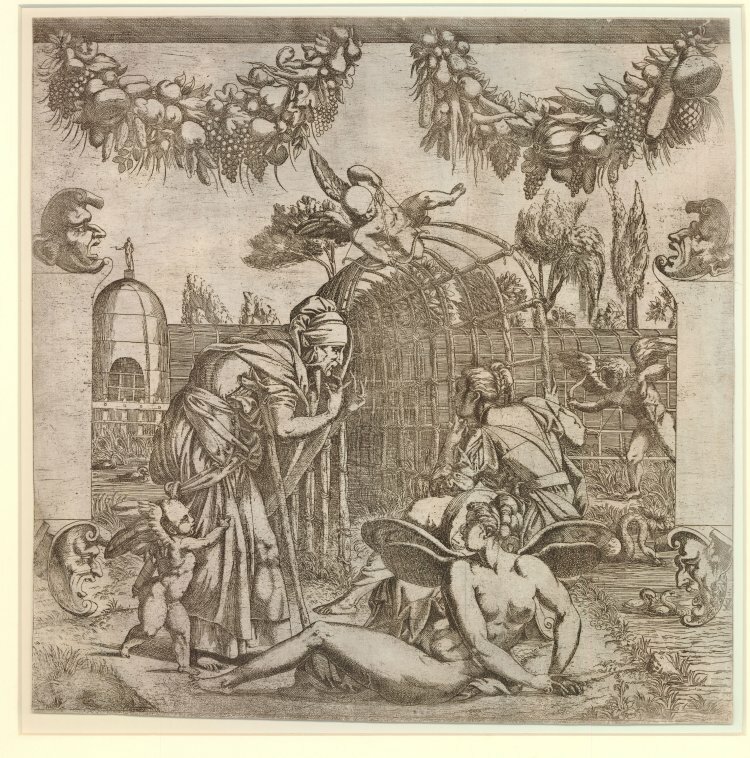 There is nothing extraordinary about this engraving and it seems very doubtful that this is the “Nunziata bizarra” mentioned by Vasari. 2 Albertina, Sc.R.504, Inv. no. 417, Hercules Fighting Aboard the Ship of the Argonauts. Inscribed: Rosso, Fiorentino fe 1530. Wickhoff, 1892, CCXIII. Dimier, 1900, 455, no. 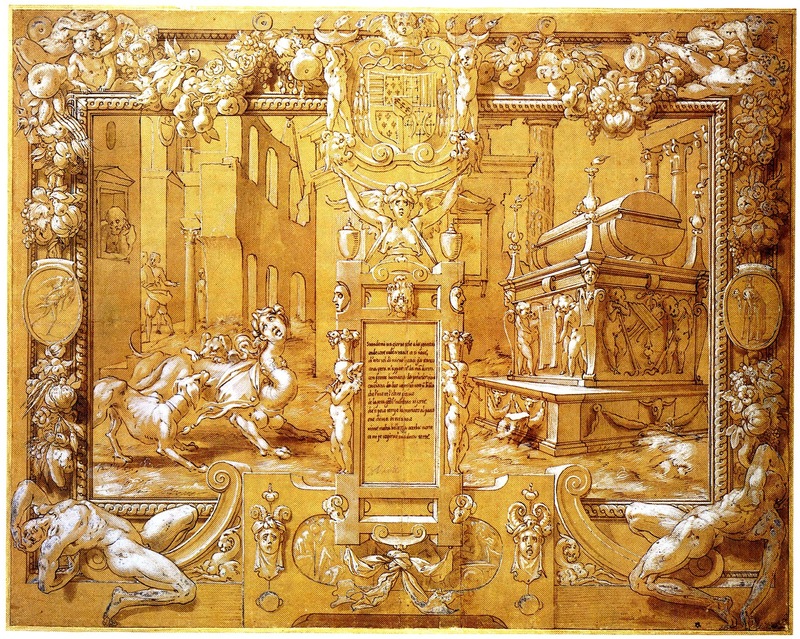 151, as by Primaticcio, 1541-1544, for the fresco on the vault of the Porte Dorée. Kusenberg, 1931, 156, no. 47, as by Primaticcio.